1. Introduction 1.1 Purpose Statement There has been an increase in the research into knowledge sharing. This research has been predominantly qualitative in nature, with many different predictors of knowledge sharing, having been identified. However, there is currently no tool available that effectively enables either; 1) The holistic identification of the factors leading to an individual’s intention to share knowledge. 2) The ability to understand the organisational factors in place that may inhibit or, excite, knowledge sharing. This research attempts to develop this quantitative tool, which is capable of assessing an individual’s intention to share knowledge, as well as, the organisational factors that will influence this. Knowledge basing is not a viable sole method of managing knowledge, and needs to be coupled with effective knowledge sharing mechanisms. Knowledge sharing has positive relationships with individual and organisational effectiveness/performance. Isolated pockets of knowledge reduce organisational effectiveness. Knowledge transferring from one actor, to another, is not possible as a simple linear process (i.e. knowledge sharing must occur between actors). Proactively sharing knowledge with others will increase individuals’ own understanding and knowledge. Electronic Journal of Knowledge Management Volume 14 Issue 2 2016 Knowledge increasingly becomes viewed as a commodity with the dawn of the knowledge worker. By the turn of the new millennium, Barth (2000), found that only 20% of workers were devoted to industrial work, the rest being devoted to knowledge work. In any organization, 90% of the knowledge is embedded and synthesized within employees’ heads (Wah, 1999; Bonner, 2000; Lee, 2000). Fetterhoff & McNamee (2011) identified that knowledge sharing is a top strategic objective for many companies. By encouraging employees to share their useful knowledge, across the organisation, the company can improve and sustain its competitive advantage (Liu and Phillips, 2011). However, Cho et al. (2007) established that individuals do not share as much knowledge as organisations would like. Therefore, as Salano (2010) contends, the sharing of knowledge leads to increased leads to an increased competitive advantage, and enhanced organisational effectiveness which, it is argued, needs to be sustained, as it is vital for a business to survive. Approach (quantitative or qualitative) Median (Web-blogging to face-to-face – Yuan et al. 2013) Industry (Engineering (Lin et al. 2012) and construction workers (Zhang and Ng 2012) to IT workers (Borges 2013)) In-groups/Out-groups (Nesheim & Hunskaar 2015). Neil David John Topping knowledge, within a supportive environment. The latent variables used, relied on measures, such as the “Big 5”, and not the underlying body of literature that this research has undertaken, to develop its’ factors. 3. Expertise The value of expertise to business will initially be discussed and critiqued, as will the approaches that have been employed to measure expertise. These will then be refined, to identify the measures that will be utilised in this research. Since this research is focused solely on “business expertise”, other types of expertise will not be discussed. 3.1 Value of Expertise Experts have better domain specific knowledge then non-experts. The superiority of experts is primarily the result of practice, not innate ability (Ericsson et al. 1993). “Skill learning refers to the gradual improvement of performance with practice that generalises to a range of stimuli with a domain of processing” Poldrack et al. (1999, p.208) Novice problem solvers, through their lack of a rich knowledge base possessed by experts, are more likely to engage in ineffective problem solving strategies e.g. trial and error & unwarranted assumptions etc. (Carr, 2010). 3.2 Measurements of Expertise Expertise has been extensively researched as a concept (Shanteau et al. 2003; Weiss and Shanteau, 2014; Germain and Tereda, 2012), but there has been no single, agreed, definition, of what constitutes of an expert. The different definitions were explored and evaluated. 3.2.1 Tenure The number of hours, days or years, working in a particular area, has been linked to expertise. However, the duration of the focus on a domain does not equate to expertise in the domain. There is extensive research that challenges the assumption that, tenure relates to expertise or effectiveness (Costa and Porter, 2003; Wright and Bonett, 2002). For this reason, tenure has not been included, as an expertise factor. 3.2.2 Consensus Researchers believe that consensus of individuals, is a basis for agreement on the identification of expertise. Therefore, disagreement within the group, of an individual’s status, as an expert, means that they are no longer able to be considered as such. This research is based upon self-assessment responses, and therefore this measure is not feasible. 3.2.3 Consistency and Reliability The level of consistency that an individual exhibits, in answering questions, and the accuracy that they achieve when answering them, has been found to be an effective measure by Cochran-Weiss-Shanteau (CWS – Shanteau et al. 2003). The measure they developed, has been well supported by further research (Weiss and Shanteau, 2014; Witteman et al. 2012; Pauley et al. 2009). Therefore, even though this approach is reliant on a series of domain specific questions, a single question has been devised that will attempt to identify this. 3.2.4 Comparative Domain Expertise (Compared to Peers) The comparison of an individual, with their peers, is an effective way to identify expertise (McHugh and Lake, 2010). Due to the nature of this research, focusing upon the individual, this measure will be based upon, the self-assessment of business expertise against others in the company. Electronic Journal of Knowledge Management Volume 14 Issue 2 2016 3.3 Evaluation of Expertise There have been a multitude of measures proposed to determine expertise, but the lack of agreement of which of these are effective, has made the development of questions relating to this area challenging. The least contested measures have been CWS and Compared to Peers. The exclusion of other expertise measures, in this research, may restrict the breadth of findings that could be achieved, but this is a deliberate act to reduce the potential negative effect on response rate, as a result of the increased number of questions. Intention to Share Knowledge Business Expertise. Neil David John Topping Autonomous Motivation Autonomous motivation has been identified to have a positive effect on knowledge sharing (Small and Sage, 2006; Hsiu-Fen, 2007; Hau and Evangelista 2007). Ability to Share Knowledge Ozmen (2010) identified that an individual’s ability to share knowledge is essential for knowledge sharing to occur. Inability to Acquire Knowledge Reinholt et al. (2011) found that the ability to acquire knowledge is an important factor in the sharing of knowledge. Self-Efficacy Zhang and Ng (2012) found that knowledge sharing was affected by knowledge self-efficacy. This has been supported by Lai and Chen (2014), who found that enjoyment, and self-efficacy, were the most influential factors leading to the intention to share knowledge. Enjoyment of Knowledge Sharing Papadopoulos et al. (2012), Lai and Chen (2014), and Hau et al. (2013), all found that enjoyment has a positive effect on knowledge sharing. Network/Opportunity to Share Knowledge/ Societal This factor relates to the individual’s position within a network. If an actor within a network is considered to have expertise, then it is important that they can be accessed, both at the right time, and by the right people. Buckman (2004) found that, people who leveraged their network, for knowledge, were successful at obtaining it through organisational “pull”, rather than centralized “push”. Motivation to Defend Ego or Distort Performance Feedback If there is a risk to knowledge sharing then, it is more likely that people will hold their knowledge, for private advantage (Chennamaneni et al. 2012; Buckman, 2004). Lack of Trust Sankowska (2013) found that organisational trust is essential, for the transfer, and creation, of knowledge. Chen et al. (2014) established that knowledge sharing can be realized, when business partners are allowed to build up levels of trust. Lack of Reciprocity Researchers have identified that reciprocity is an effective motivator in promoting knowledge capacity (Kankanhalli et al. 2005; Wasko and Faraj, 2005; Namjae et al. 2007). This is reinforced by Chennamaneni et al. (2012) who identified, reciprocity as a salient motivator of an employee’s likelihood to share knowledge. This position is supported by Hau et al. (2013), who found that the presence of reciprocity has a positive effect on knowledge sharing. Attitudes Towards Knowledge Sharing (Self) It is important for an individual to have a positive attitude towards tacit knowledge sharing, or they are unlikely to engage in this practice. Shiuann-Shuoh et al. (2012) found that attitude positively impacts the most upon the intention to share tacit knowledge. Attitudes Towards Knowledge Sharing (Others) Shiuann-Shuoh et al. (2012) did not specify attitude as being towards self or others. Therefore, this has been divided into two factors for this research. Sociability In an organisation, an individual may be sociable, to a greater or lesser extent. Osterloh and Frey (2000) found that a greater amount of sociability in organisation, led to increased knowledge sharing. Friendship Osterloh and Frey (2000) found that friendship was an important part of knowledge sharing. In psychological terms, this is likely to create divisions of ‘in-groups’ and ‘out-groups’, depending on how restrictive, and / or how powerful, the knowledge possessed is. Electronic Journal of Knowledge Management Volume 14 Issue 2 2016 Incentives Hau et al (2013) found that rewards and incentives reduced knowledge sharing. Incentives of all types have been studied; ranging from financial to non-financial, individual to team, that has support this finding (Hu and Randel, 2014; Wolfe and Loraas, 2008; Fey and Furu, 2008). Minority Group This is based upon research by Polzer et al. (2006), who found that minority, or majority, sub-groups, have negative impacts upon knowledge sharing outcomes. Hierarchical Position The interviews, this research conducted, yielded an interesting finding, in that peer-to-peer knowledge sharing was more prevalent than hierarchical knowledge sharing. Perceived Level of Interest from Learner A common theme uncovered from the interviews in this research indicated that, the individual was motivated when the learner appears interested in the knowledge being shared. Professionalism A final finding from these research interviews is that an individuals’ self-perception of their level of professionalism, affected their intention to share knowledge. Individuals, who considered themselves professionals, stated that they would not be prevented from sharing their knowledge with others. Table 2 - Items relating to business expertise 4.3.1 Consistency and reliability Consistency and Reliability (the CWS measure), is the ability to answer questions from the business, in the same manner, and with the same degree of accuracy. The CWS specifically, refers to ‘discrimination’, but this was misinterpreted during the interviews, and has been re-presented as ‘reliability’. This is expected to have a positive relationship with business expertise. 4.3.2 Comparison to Peers Comparison to Peers is the process whereby the individual position themselves, when compared to all of their colleagues, and is specifically relating to their business expertise. This is expected to be positively related to business expertise. 4.4 Latent Variable Comparison - Expertise and Knowledge Sharing The relationship between business expertise, and knowledge sharing, is expected to be positive. This is based upon the assumption that, as an individual accrues knowledge, they will become more confident in what they know and have a desire to share their knowledge. Figure 1 shows the relationship between the knowledge sharing factors and the Knowledge Sharing latent variable. The expected correlations can be found in Table 1. Figure 1: Items related to Knowledge Sharing Figure 2 details the relationship between the Business Expertise factors and the Business Expertise latent variable. Table 2 shows the expected correlation. Figure 2: Items related to Business Expertise Figure 3 shows the relationship between the latent variables and both the Business Expertise and Knowledge Sharing Factors. 5. Aim A1: To attempt to build a model that tests Business Expertise and Knowledge Sharing factors to enable the categorisation of individuals into different knowledge sharing types. 6. Hypotheses H0 – There will be no relationship between the factors and the latent variables. H1 – Intrinsic factors of knowledge sharing have a positive effect, on an individual’s intention to share knowledge H2 – Extrinsic factors of knowledge sharing have a positive effect on an individual’s intention to share knowledge. H3 – Intrinsic factors of knowledge sharing will have a greater impact on an individual’s intention to share knowledge, than will extrinsic factors. H4 – The expertise factors will have a positive relationship with Business expertise. H5 – Business expertise and the Intention to share knowledge will be positively related. Table 1 identifies whether knowledge sharing factors are intrinsic or extrinsic. H1, H2 and H3 relate to the Intention to share knowledge latent variable. H4 relates to the Business expertise factors relating to the Business expertise latent variable. H5 refers to the relationship between the two latent variables (Business Expertise and the Intention to share knowledge). Neil David John Topping and an elective report, detailing the type of knowledge sharer the participant was, based upon the assumptions identified in the literature. 7.3 Design A questionnaire based design was employed to assess differences between participants. The tool was administered once to all participants, during the four month period between February 2014 and May 2014. 7.4 Procedure Prospective participants were contacted on an opportunistic basis. They were asked to fill in the survey, and informed that they could receive a report, if requested, detailing their knowledge sharing type. This report was only supplied, after completion, if an e-mail address had been provided. 8. Results & Discussion 8.1 Overview The model of the research did not achieve a goodness of fit. This means that the model in itâ&#x20AC;&#x2122;s entirety needs to be adapted to ensure that it covers both business expertise and knowledge sharing. There are questions that have been used that have been significantly correlated to either Business Expertise or Knowledge Sharing. This means that these questions can be used in other researches with a degree of confidence. This section begins with response rates and descriptive statistics. These are followed by the model testing then a summary. The research aim and hypotheses are then considered followed by the researches limitations, implications and recommendations. 8.2 Analytical Method A Confirmatory Factor Analysis (CFA) was used, based upon Structural Equation Modelling (SEM) output. The two latent variables, intention to share knowledge, and expertise, were created to attempt to confirm the model, based upon the expected relationships with their factors. 8.3 Response Rate 135 participant responses were achieved of which, 103 completed the entire survey. This means that 76% of participants that started the survey and completed all the mandatory questions. Some questions within the descriptive statistics were optional and, as such, did not achieve the 103 completed responses. For the purposes of the descriptive and statistical analysis, only those surveys where all the mandatory questions had been completed were considered. Current position Table 5 shows that very few participants identify themselves as Junior, which might be related to the mean age being 42.5. The majority considered themselves to be professional, with Middle Manager coming in second. Table 5 - Current Position What is your current position? Level of Education Table 7 shows that 72% of participants had completed higher education (Bachelor or Master’s Degree, or PhD). The lowest level of education recorded was Secondary/High School, which made up 5% of participants. Neil David John Topping Table 7 - Education What is your highest level of education you have completed? 8.5 Model Testing 8.5.1 Goodness of Fit (GFI) The chi-square value, produced by Stata, was 208.03, with degrees of freedom of 167. The significance of the chisquare test is p-value of 0.017 (p<0.05). Table 9 - Modification Indices Even were all of the modifications adapted into the model it would still not achieve a Goodness of Fit. The covariances provide a view of how some of the factors could be clustered. Such as: Lack of Reciprocity, Attitudes towards sharing knowledge (Others) and Sociability Perceived level of interest from learner, Friendship, and Incentives. Variable Testing 8.5.2 Intention to Share Knowledge Latent Variable Only 6 factors were identified as being significantly related. These can be seen below, ranked based upon the strength of their factor loading. 1) Autonomous Motivation (P>0.05). The factor loading was 0.65, with a standardised error of 0.12, and a Zscore is 5.42. 2) Attitude towards sharing knowledge (Self) (P>0.05). The factor loading was 0.44, with a standardised error of 0.12, and a Z-score of 3.7. 3) Self-efficacy (P>0.05).The factor loading was 0.42, with a standard error of 0.12, and a Z-score of 3.45. 4) Minority Group (P>0.05). The factor loading was 0.33, with a standardised error of 0.14, and a Z-score of 2.35 5) Incentivisation (P>0.05). The factor loading was 0.33, with a standardised error of 0.14, and a Z-score of 2.35. 6) Sociability (P>0.05). The factor loading was 0.16, with a standardised error of 0.14, and a Z-score of 2.21. This means that, of the factors listed above, 1, 2, 3, and 6 are intrinsic in nature, whilst 4 and 5 are extrinsic. The greater the number of intrinsic factors, with a collectively higher factor loading, means we can confidently infer that, an individualâ&#x20AC;&#x2122;s intention to share knowledge, is driven, to a greater extent, by intrinsic factors, rather than extrinsic factors. The non-significantly related items can be observed in Table 9. Critique of the Intention to Share Knowledge Latent Variable The identification of 6 factors that are significantly related to the latent variable is promising, but diminished by the lack of GFI. The rejection of 12 factors, which were not found to have a significant relationship, can assist in the focusing of further research into knowledge sharing. Comparison to Peers was also found to be significantly related to Business Expertise (p>0.01). The factor loading was 0.62, with a standardised error of 0.18, and a z-score of 3.51. Interestingly, this is less significant than the Consistency and Reliability latent variable, but has a higher factor loading. 8.5.4 Latent Variable Correlation The latent variables of Intention to share knowledge and Business Expertise were found to be significantly related to each other (p>0.01), with a factor loading of 0.71, a standard error of 0.19, and a z-score of 3.66. We can see from the high positive factor loading that, this relationship is positive, whereby, the higher the business expertise, the greater the intention to share knowledge. 8.6 Summary The research has been successful in confirming the overall relationship of the factors for the intention to share knowledge latent variable. The 2 factors, comprising the business expertise latent variable, were also found to be significantly related to the latent variable. Both of the latent variables were found to be significantly related to each other. However, a GFI was not achieved, for the model, which means there are further factors that need to be considered. Building upon the 6 intentions to share knowledge factors, and the 2 business expertise factors, we can create a Venn diagram (Figure 3). Figure 3- Venn Diagram of Knowledge Sharing Types The naming of the different type of knowledge sharer is a product of this research. The specific naming is intended to reflect the identity of the category. These will be detailed and the each categorisation critiqued. The inclusion of the Venn diagram, when the results of this research categorise over 87% of participants into a single type, is to provide a framework for further researches. Maestro This is an individual who has both, a high degree of knowledge sharing intention, and business expertise, and is regarded as the optimal type of knowledge sharer. In terms of their expertise, they are consistent, reliable, and identified as one of the best, in the company, for their domain of business specific knowledge. As long as the business expertise they possess is relevant to the organisation, they will be considered valuable. Their intention to share knowledge is high, based upon the 6 significant factors identified. As 4 out of 6 factors here are intrinsic, they must have at least a moderate degree of intrinsic factors leading to their intention, but these need to be balanced with high extrinsic factors. Catalyst This individual has a high degree of knowledge sharing, but can potentially be considered a liability, due to the fact that they do not possess a high level of business expertise. They can be converted in to an organisational asset, if they are positioned in an area of relevance, or growth, where they could develop their expertise, with the view of becoming a maestro. We can see, from the categorisation of individuals, that they are not evenly distributed. For expertise, this is an expected outcome, based upon the participant selection criteria, where individuals needed to have had at least 3 years business experience. There is also expected to be a degree of self-assessment bias in these results, relating to expertise through the self-assessment process. A greater number of participants is also needed along with a model that provides a Goodness of Fit. 8.8 Hypothesis Testing H0 – There will be no relationship between the factors and the latent variables. Whilst not all of the items had significant relationships to their latent variables six out of eighteen factors (or 33.3%) were significantly related to the intention to share knowledge. Both of the expertise factors were significantly related to the Business Expertise latent variable (or 100%). Therefore we can reject the null hypothesis. H1 – Intrinsic factors of knowledge sharing have a positive effect on an individual’s intention to share knowledge. Neil David John Topping When we exclude the non-significant factors, we can see that the 4 intrinsic factors knowledge sharing factors have a positive effect on an individual’s intention to share knowledge. The 4 significant intrinsic factors have an average factor loading of 0.45, showing a positive effect. This is a moderate positive effect, but still a positive effect, therefore this hypothesis cannot be rejected. H2 – Extrinsic factors of knowledge sharing have a positive effect on an individual’s intention to share knowledge. There were only 2 knowledge sharing factors that were found to be significant in this research that were identified as extrinsic. These were found to have a positive correlation to the individual’s intention to share knowledge. These two factors had an average factor loading of 0.33, demonstrating a positive effect, and therefore, this hypothesis cannot be rejected. H3 – Intrinsic factors of knowledge sharing will have a greater impact on an individual’s intention to share knowledge than extrinsic factors. The greater quantity, and quality, of intrinsic factors, over extrinsic factors, means that we cannot reject this hypothesis. This is reinforced by intrinsic factors (0.45) having a greater factor loading then extrinsic factors (0.33). However, it is worth noting that, a smaller selection of extrinsic factors were identified in the literature, and have therefore not been included in this research. H4 – The expertise factors will have a positive relationship with business expertise. The two factors are both significantly related to business expertise, with positive factor loadings. Therefore this hypothesis must be accepted. H5 – Business expertise and the Intention to share knowledge will be positively related. This has been found to be true, for this research, and means that this hypothesis must be accepted. 8.9 Limitations There were two main limitations of this research. The goodness of fit of the model The model was rejected in terms it’s GFI. Further research would benefit from identifying additional modification paths, and factors, for consideration. Further factors would need to be considered to achieve a GFI, since the paths alone are insufficient to achieve this. Number of participants The number of participants was at the lower end of the scale, but accordingly to Ding et al.’s (1995) review of studies, 100 to 150 participants is the minimum for SEM. This means that more participants would be beneficial for future research. 8.10 Implications of this research The implications are separated into academic benefits and practitioner implications. 8.10.1 Academic implications This research has been partially successful at collecting and testing factors found in the literature that, are expected to have some degree of correlation to the intention to share knowledge. However, the lack of GFI means that further exploration is required beyond what has been found in this research. Additionally, the low sample size means that a greater number of participants for future research would be needed. Intrinsic factors were found to relate more strongly, than extrinsic factors, to the intention to share knowledge. Therefore, future research into knowledge sharing would benefit from focusing particular effort on intrinsic factors. Electronic Journal of Knowledge Management Volume 14 Issue 2 2016 The CWS measure has successfully been employed in a generic questionnaire based manner. This indicates that the following question could be tested in wider research into expertise. “Relating to your business expertise above - out of the last 10 questions at work, how many did you quickly and correctly answer?” 8.10.2 Practitioner implications The four types of knowledge sharer and expertise measures, with their underlying data, specifically benefit organisations in 4 ways. 1) Recruitment – To identify if a prospective employee exhibits knowledge sharing attitudes. This would effectively enable the removal of prospective candidates, if they do not demonstrate the required amount of intention to share knowledge. 2) Assessing organisational state – The questionnaire could be used to identify factors affecting business units, or the organisation’s levels of knowledge sharing, for both base-lining either, a change in programme, or a longitudinal review of knowledge sharing, within the organisational area, to evaluate success. 3) Restructuring – This tool could be used, in conjunction with other methods, to determine how best to restructure teams. Specifically with regards to creating innovative teams, or less innovative teams, depending on the business requirements. 4) Team Building – Identifying inhibitors of knowledge sharing, across teams, and then taking relevant action to address this. 8.11 Recommendations for further research The recommendations for further research are grouped into five categories. Factor enhancement We have successfully identified 6 factors that are significantly related to the intention to share knowledge. If the significant factors were broken down into their component parts and analysed within a larger sample population, this would add accuracy and power to the model. Consideration of additional knowledge processes This research focused upon knowledge sharing. However, the three processes that were omitted were knowledge creation, knowledge storage, and knowledge application. Were these to be added to this model, a holistic overview could be achieved of all the organisational knowledge processes. A holistic model would add value to both academics and practitioners that would enable the identification of the factors that act as predictors to all four processes. Enhancement of the focus upon expertise Expertise comprised of two questions that were significantly related to business expertise. The reason that further factors were not included was to focus upon the intention to share knowledge latent variable. Future research could expand upon these aspects. Observer assessment This research has focused exclusively upon individual’s self-assessment against various questions. The reason for this was twofold; to reduce the number of questions to attempt to maximise response rates, and by removing the need for participants to know each other. This last point would certainly be needed for the inclusion with an observer assessment. Zhou et al. (2012) found assessment of others removed the self-assessment bias. Agency Based Social Simulation A growing focus of literature is using social situation software to generate models for behaviour (Lanham and Carley, 2014; Nemiche et al. 2013; Villatoro, 2013). The four core knowledge organisational processes, when analysed, could be coded into such a model. This should then be able to identify the patterns of behaviour among employees for all these processes. 9. Conclusion This research has been partially successful in achieving both its’ aim and testing the hypotheses. A model has been developed that achieves part of it’s purpose in identifying who is likely to share their knowledge within an organisation and the underlying reasons for this. This model also can also be used to categorise individuals into 4 distinct types of knowledge sharer. The model itself would benefit from further testing and refinement. The lack of goodness of fit of the model meant that, the items require further consideration, along the lines of the modification indices that were offered. The modification indices alone are insufficient to achieve a Goodness of Fit, and therefore further knowledge sharing factors need to be identified. Further research would benefit from building on foundations of this research to encompass the additional organisational knowledge processes. This would enable a holistic view of the knowledge life-cycle within organisations. This research should include observer assessment, which would act as a countenance to the selfenhancement bias that has potentially occurred in this research. A much greater number of participants and an exploration into the relationship between participants would enable observer assessments to be conducted. This would require participants to know each other, this would perhaps, be facilitated in a single medium to large company. If this research was to be repeated, a greater amount of interviews, and focus groups, should take place, to identify further items that may have led to the intention to share knowledge. References Ajzen, I. (1991), The theory of planned behaviour, Organizational Behaviour & Human Decision Process, 50 (2), pp.179–211. Arbuckle, J.L. (2007), Amos 16.0 User’s Guide. Chicago: SPSS Inc. Barth, S. (2000), Heeding the sage of the knowledge age [Online]. Available at: http://www.destinationcrm.com/articles/default.asp?ArticleID=832 Bautista-Frias, L., Romero-Gonzalez, R., and Morgan-Beltran, J. (2012), Knowledge maps in the conversion of tacit knowledge as a competitive strategy, Advances In Competitiveness Research, 20 (3/4), pp.47-58. Bonner, D. (2000), Knowledge: from theory to practice to golden opportunity, American Society for Training & Development, September-October, pp.12-13. Borges, R. (2013), Tacit knowledge sharing between IT workers. The role of organizational culture, personality, and social environment, Management Research Review, 36 (1), pp.89-108. Buckman, R. H. (2004). Building A Knowledge-Driven Organization. McGraw-Hill: United States of America Busch, P., Richards, D., Dampney, C. N. G. (2003), The graphical interpretation of plausible tacit knowledge flows. Conferences in Research and Practice in Information Technology. Cambridge Dictionaries Online. Source http://dictionary.cambridge.org/dictionary/english/knowledge-worker extracted on 16/11/2015 at 18:08. Carr, M. (2010), The importance of meta cognition for conceptual change and strategy use in mathematics, in Waters, H. S. and Schneider, W. (eds.) Meta cognition, strategy use and instruction. New York: Guilford Press. pp. 176-197. Chen, Y. H., Lin, T. P., and Yen D. C (2014), How to facilitate inter-organizational knowledge sharing: The impact of trust, Information & management. 51 (5), pp.568-578. Chennamaneni, A., Teng, J., and Raja, M. (2012), A unified model of knowledge sharing behaviours: theoretical development and empirical test. Behaviour & Information Technology, 31 (11), pp.1097-1115. Cho, N., Li, G. Z., and Su, C. Z. 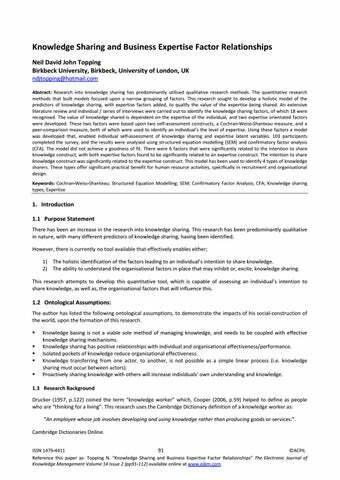 (2007), An empirical study on the effect of individual factors on knowledge sharing by knowledge type. Journal of Global Business and Technology, 3 (2), pp.1-15. Cooper, D. (2006) Knowledge Workers, Canadian Businesses. 79 (20), p.59. Costa, B. and Porter, G. (2003), 'Mutual Fund Managers: Does Longevity Imply Expertise? ', Journal Of Economics & Finance, 27 (2), p.224. Ding, L., Velicer, W. F., & Harlow, L. L. (1995). ‘Effects of estimation methods, number of indicators per factors, and improper solutions on structural equation modelling fit indices’. Structural Equation Modelling: A Multidisciplinary Journal, 2, 119-143. Drucker, P. (1957), Landmarks of Tomorrow. New York: Harper & Row. p.122. Ericsson, K. A., Krampe, R., T., H., and Tesch-Romer, C. (1993), The role of deliberate practice in the acquisition of expert performance. Psychological Review, 100 (3), pp.363-406. Fetterhoff, T., Nila, P., and McNamee, R. C. (2011), ‘Accessing internal knowledge: organizational practices that facilitate the transfer of tacit knowledge’. Research Technology Management, 54 (6), pp.50-54. Fey, C. and Furu, P. (2008). Top management incentive compensation and knowledge sharing in multinational corporations. Strategic Management Journal, 29 (12), pp.1301-1323. Germain, M. and Tejeda, M. (2012), 'A preliminary exploration on the measurement of expertise: An initial development of a psychometric scale', Human Resource Development Quarterly, 23 (2), pp.203-232. Electronic Journal of Knowledge Management Volume 14 Issue 2 2016 Gubbins, C., Corrigan, S., Garavan, T., Connor, C., Leahy, D., Long, D., and Murphy, E. (2012), Evaluating a tacit knowledge sharing initiative: a case study, European Journal of Training & Development, 36 (8), pp.827-847. 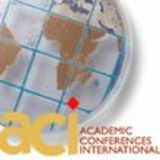 Hau, L. N. and Evangelista, F. (2007), Acquiring tacit and explicit marketing knowledge from foreign partners IJVs. Journal of Business Research, 60 (11), pp.1152-1165. Hau, Y., Kim, B., Lee, H., and Kim, Y. (2013), 'The effects of individual motivations and social capital on employees’ tacit and explicit knowledge sharing intentions', International Journal Of Information Management, 33 (2), pp.356-366. Hu, L. and Randel, A. (2014), Knowledge Sharing in Teams: Social Capital, Extrinsic Incentives, and Team Innovation. Group & Organization Management, 39 (2), pp.213-243. Hu, L. and Bentler, P.M. (1999), Cutoff criteria for fit indexes in covariance structure analysis: conventional criteria versus new alternatives. Structural Equation Modelling, 6, pp.1-55. Hsiu-Fen, L. (2007), Effects of extrinsic and intrinsic motivation on employee knowledge sharing intentions. Journal of Information Science, 33 (2), pp.135-149. Kankanhalli, A., B. C. Y. Tan, and K. K. Wei (2005), Contributing Knowledge to Electronic Knowledge Repositories: An Empirical Investigation, MIS Quarterly, 29 (1), pp.113-143. Kennedy, J., Gubbins, C., and Buckley, F. (2012), How do Individuals Affect the Process of Managing Tacit Knowledge? Proceedings Of The European Conference On Knowledge Management, 21411-1417. Kumaraswamy, K. S. N. and Chitale, C. M. (2012), Collaborative knowledge sharing strategy to enhance organizational learning, Journal of Management Development, 31 (3), pp.308-322. Lai, H. M. and Chen, T. T. (2014). Knowledge sharing in interest online communities: A comparison of posters and lurkers. Computers in Human Behaviour, 35, pp.295-306. Lanham, M., Morgan, G., and Carley, K. (2014), Social Network Modeling and Agent-Based Simulation in Support of Crisis DeEscalation. IEEE Transactions on Systems, Man & Cybernetics. Systems, 44 (1), pp.103-110. Lee, J. (2000), Knowledge management: the intellectual revolution. IIE Solutions, 32, pp.34-37. Lin, I., Seidel, R., Shekar, A., Shahbazpour, M., and Howell, D. (2012), Knowledge Sharing Differences Between Engineering Functional Teams: An Empirical Investigation. Journal of Information & Knowledge Management, 11 (3), 1250021-1-125002114. Liu, Y. and Phillips, J. S. (2011), Examining the antecedents of knowledge sharing in facilitating team innovativeness from a multilevel perspective. Information Management, 31 (1), pp.44-52. McHugh, M. D. and Lake, E. T. (2010), Understanding Clinical Expertise: Nurse Education, Experience, and the Hospital Context, Research in Nursing and Health, 33 (4), pp.276–287. Michailove, S. and Minbaeva, D. (2012), Organizational Values and Knowledge Sharing in Multinational Corporations: The Danisco Case, International Business Review, 21 (1), pp.59-70. Namjae, C., Guo Zheng, L., and Che-Jen, S. (2007), An empirical study on the effect of individual factors on knowledge sharing by knowledge type, Journal Of Global Business & Technology, 3 (2), pp.1-15. Nemiche, M., M'Hamdi, A., Chakraoui, M., Cavero, V., and Pla Lopez, R. (2013), A Theoretical Agent-Based Model to simulate an Artificial Social Evolution. Systems Research & Behavioral Science, 30 (6), pp.693-702. Nesheim, T & Hunskaar, H, M (2015). When employees and external consultants work together on projects: Challenges of knowledge sharing. International Journal of Project Management 07/2015; 33(7) Osterloh, M. and Frey, B. S. (2000). Motivation, knowledge transfer, and organizational forms, Organization Science, 11 (5), pp.538550. Ozmen, F. (2010), The capabilities of the educational organizations in making use of tacit knowledge. Procedia - Social and Behavioral Science, 9, pp.1860-1865. Papadopoulos, T., Stamati, T., and Nopparuch, P. (2012), Exploring the determinants of knowledge sharing via employee knowledge sharing via employee weblogs. International Journal of Information Management, 33 (1), pp.133-146. Pauley, K., O'Hare, D., and Wiggins, M. (2009), Measuring Expertise in Weather-Related Aeronautical Risk Perception: The Validity of the Cochran-Weiss-Shanteau (CWS) Index. International Journal of Aviation Psychology, 19 (3), pp.201-216. Poldrack, R. A., Prabhakaran, V., Seger, C. A., and Gabrieli, J. D. E. (1999), Striatal activation during acquisition of a cognitive skill, Neuropsychology, 13 (4), pp.564 –574. Polzer, J., Crisp, C. B., Jarvenpaa, S.L., and Kim, J. W. (2006). Extending the faultline model to geographically dispersed teams: How collocated subgroups can impair group functioning, Academy of Management Journal, 49 (4), pp.679–692. Reinholt, M., Pedersen, T., and Foss, N. J. (2011), Why a central network position isn't enough: the role of motivation and ability for knowledge sharing in employee networks. Academy of Management Journal, 54 (6), pp.1277-1297. Reychav, I. and Weisberg, J. (2010), Bridging intention and behavior of knowledge sharing, Journal of Knowledge Management, 14, pp.285–300. Ryan, S. and O’Connor, R. V. (2013), Acquiring and sharing tacit knowledge in software development teams: An empirical study. Information & Software Technology, 55 (9), pp.1614-1624. Sankowska, A. (2013), Relationships between organizational trust, knowledge transfer, knowledge creation, and firm's innovativeness, Learning Organization, 20 (1), pp.85-100. Sambamurthy, V. and Subramani, Mani. (2005), Special Issue on Information Technology and Knowledge Management, MIS Quarterly, 29 (2), pp.193-195. Schumacker, R. E. and Lomax, R. G. (2004) A Beginner’s Guide to Structural Equation Modeling, Volume 2: Lawrence Erlbaum Associates. Neil David John Topping Senge, P. M. (1990), The Fifth Discipline. America: Doubleday/Currency. Weiss D. J., and Shanteau J. (2014), Who's the Best? A Relativistic View of Expertise, Appl. Cognit. Psychol., 28: 447–457. DOI: 10.1002/acp.3015 Shanteau, J., Weiss, D., Thomas, R., and Pounds, J. (2003), How can you tell if someone is an expert? Performance-based assessment of expertise, in Schneider, S. L. and Shanteau, J. (eds.) Emerging perspectives on judgment and decision research. New York: Cambridge University Press. pp. 620-639. Shiuann-Shuoh, C., Yu-Wei, C., and Pei-Yi, C. (2012), Behavioral Intention formation in knowledge sharing: Examining the roles of KMS quality, KMS self-efficacy, and organizational climate. Knowledge-Based Systems. 31, pp.106–118. Small, C. and Sage, A. (2006), Knowledge management and knowledge sharing: A review, Information Knowledge Systems Management, 5 (3), pp.153-169. Solano, B. R. (2010), Organizational politics, personality and willingness to share knowledge: The mediational role of employee engagement, Dissertation Abstracts International, 71, 2-B. Villatoro, D. (2013), Social norms for self-policing multi-agent systems and virtual societies, AI Communications, 26 (2), pp.255-256. Wang, Z. and Wang, N. (2012), Knowledge sharing, innovation and firm performance, Expert Systems with Applications, 39 (10), pp.8899-8908. Wasko, M. and Faraj, S. (2005), Why should I share? Examining social capital and knowledge contribution in electronic networks of practice, MIS Quarterly, 29 (1), pp.35-57. Wah, L. (1999), Making knowledge stick, Management Review, 88 (5), pp.24-9. Witteman, C., Weiss, D., and Metzmacher, M. (2012), Assessing Diagnostic Expertise of Counselors Using the Cochran—Weiss— Shanteau (CWS) Index. Journal of Counselling & Development, 90 (1), pp.30-34. Wolfe, C. and Loraas, T. (2008), Knowledge Sharing: The Effects of Incentives, Environment, and Person. Journal of Information Systems, 22 (2), pp.53-76. Wright, T. and Bonett, D. (2002). The Moderating Effects of Employee Tenure on the Relation Between Organizational Commitment and Job Performance: A Meta-Analysis. Journal of Applied Psychology, 87 (6), pp.1183-1190. Yuan, Y., Zhao, X., Liao, Q., and Chi, C. (2013), The use of different information and communication technologies to support knowledge sharing in organizations: From e-mail to micro-blogging. Journal of The American Society For Information Science & Technology, 64 (8), pp.1659-1670. Zhang, P. and Ng, F. (2012), Attitude toward knowledge sharing in construction teams, Industrial Management & Data Systems, 112 (9), pp.1326-1347. Zhou, K. and LI, C. (2012), How knowledge affects radical innovation: Knowledge base, market knowledge acquisition, and internal knowledge sharing, Strategic Management Journal, 33 (9), pp.1090-1102.